Getting rid of stuff is just one piece of the downsizing puzzle. 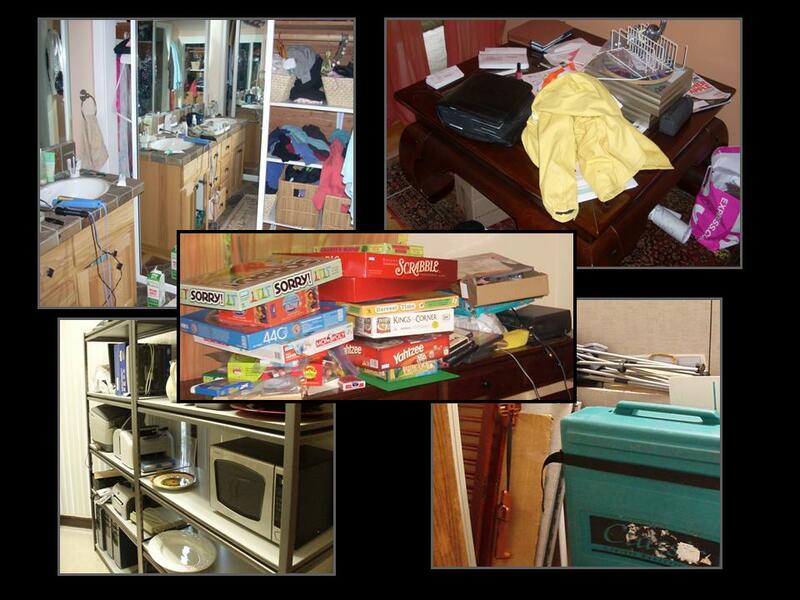 There are many other components including where, how, what and who gets the items you are letting go of. Community Warehouse has been on my Resources Page for years as one of the best places to donate household goods and there are lots of reasons why. Their mission of “redistributing donated furniture and household goods to neighbors in need” continues to grow in demand along with the number of working class poor. The nonprofit is one of the few places that accepts mattress donations (no kings/always in need of twins), drop off is open 7 days a week AND they offer pick up service ($30 nominal fee). I recently toured their newer Tualatin location and was impressed by its organized and efficient operation as well as the welcoming staff. Like its parent location in NE Portland, the warehouse is divided into two sections. The largest area contains about 90% of the donations and it’s where clients are outfitted with everything from linens and a set of cookware to dining chairs and a sofa. Their Estate Store sells select items at great prices to benefit the mission. It’s open to the public 7 days a week. CW networks with over 200 agencies between Portland and Corvalis and in 2014 helped over 7,000 neighbors in need. AND kept 550+ tons of stuff out of landfills. Now that’s a WIN-WIN! Visit Community Warehouse to learn more about scheduling a pick up, location hours and items most needed. How you let go of your stuff matters. Contact me if you need guidance. 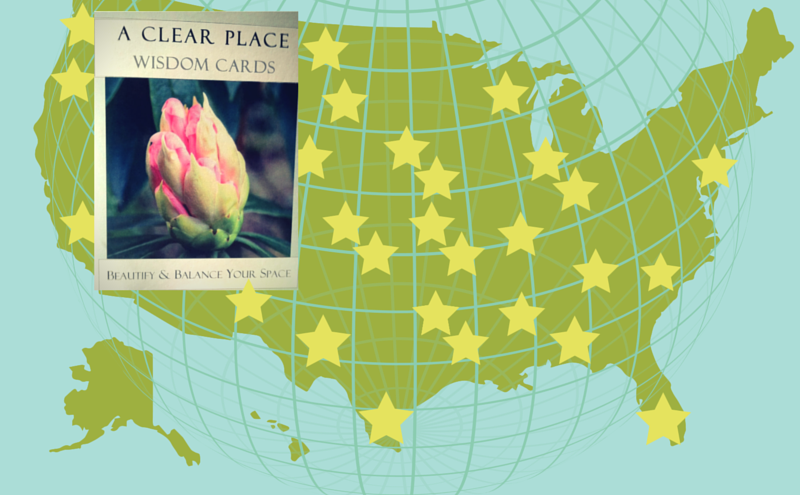 As always, thanks for being mindful of where things go … and for doing your part in making our Earth a lighter place! TIP: Not in the PDX corridor? Use the nationwide donate/recycle guide at Earth 911 (another favorite from my Resources Page). Just put in your zip code and up pops a list of who in your area accepts what you what to donate. Easy! You don’t have to be a wine drinker to appreciate those cute tote bags. 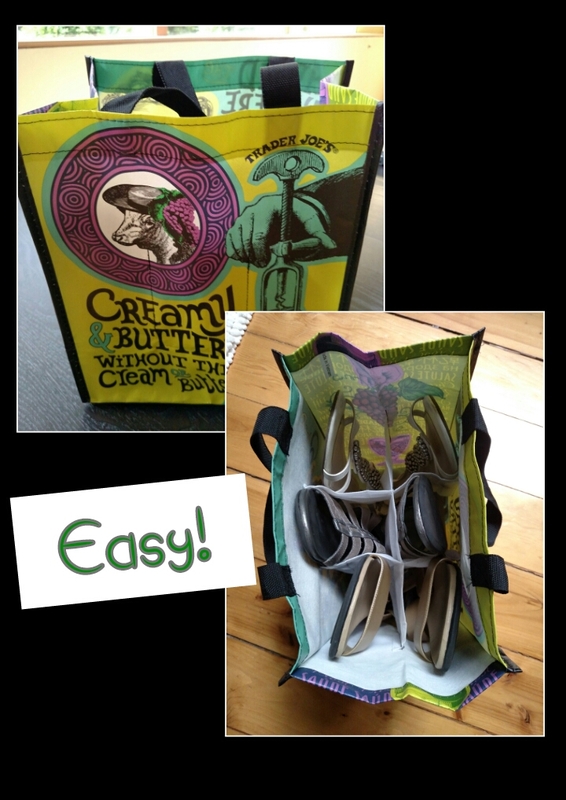 Everyone from Trader Joe’s to Fred Meyer offers bottle carrier bags in a variety of materials and patterns. I find the pocketed totes perfect for storing/transporting any number of things. First tip: shoes. These make for great portable shoe bags. Holds three pairs with each shoe getting its own pocket. For optimum protection, place clean shoe heel in first with sole facing out. Works best with low heels/flats/sandals. Tote fits easily into a closet for storage or in the back seat of your car for travel. Eco note: Whether they are poly or jute, reusable bags only help the environment if they are reUSED a lot. Be sure you get the most mileage from yours by thinking creatively and acting resourcefully. Thank you for helping to make the earth a clearer place. Magic happens when you say YES to less! You win on so many levels when you clear out your stuff. 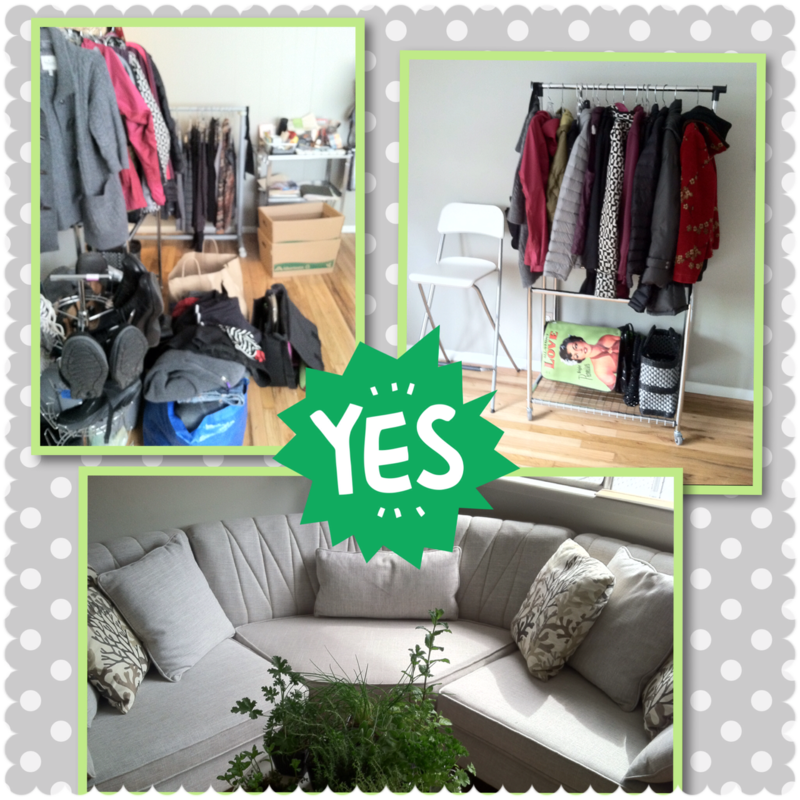 This PDX homeowner saw firsthand the magic that can happen when you say YES to clearing out. Find out more and get FREE ACP Sorting Guide. View “Say YES to Less” from A Clear Place. HAPPY EARTH DAY … thanks for making it a clear one!